Today I started my online journey which pretends like a diary, but full of news and views related to cultural side of Bengal and Bengali(s). 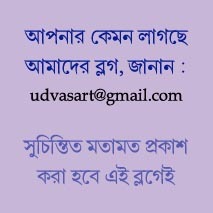 Udvas is an integrated part of my cultural journey and so I named my blog as Mrinal & Udvas. This entry was posted in Cultural journey and tagged art, artist, Bengal, culture, new blog, Udvas. Bookmark the permalink.